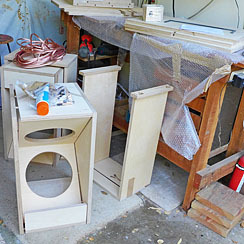 The LX521 Construction Plans provide drawings and information for cutting wood and assembling the speaker baffles. 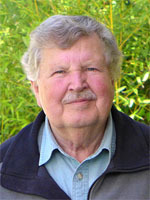 Not everyone has access to the necessary tools, working area or skill to build the baffles from scratch. On this page I will document my experiences and observations when staring out with pre-cut wood parts and subassemblies from www.MagicLX521.com. 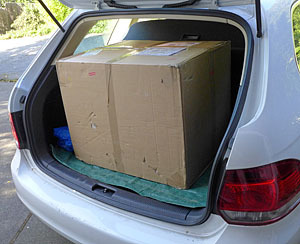 Pick up of a large (28 x 22 x 22 inch) and heavy box from the local Post Office, nine days after its shipment from Germany. Two more boxes are on their way. 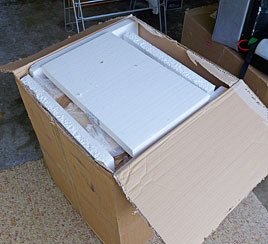 Opening the box reveals good packaging for moderate handling during transportation. 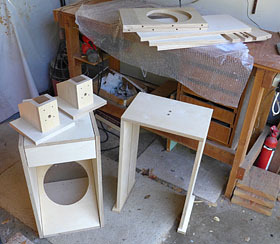 The box contained a non-glued woofer baffle and bridge, two assembled stands and parts for another bridge and woofer, made of 13-layer plywood. The second box arrived 14 days after shipment. US Customs charged 8% of sales price for total shipment. 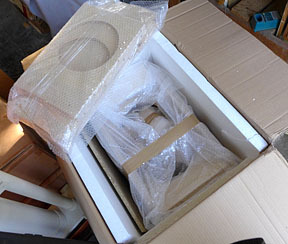 The box contained a woofer, bridge, connector brackets, wiring, glue, various screws and small parts. Box 3 of 3 arrived 4 weeks later after having been incorrectly routed by the USPS or US Customs. Nothing was damaged, but the delay meant that I had other project priorities. 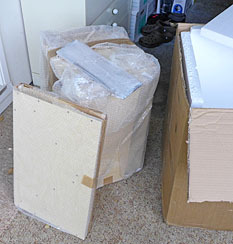 Hopefully in July I will find time to assemble the baffles, otherwise I must wait until September 2013. But that's when I must see and photograph the Americas Cup Finals!